Timber Cove is a beautiful, coastal village with dramatic ocean views. 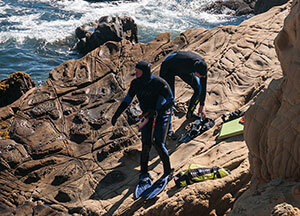 Fabulous abalone diving, hiking, nature walks, and tide pooling all along the Pacific Ocean. 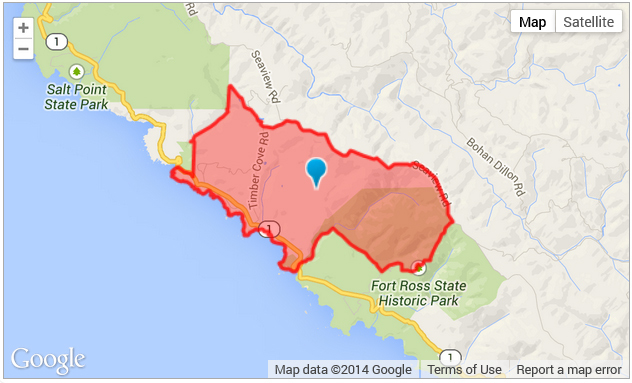 Timber Cove, is a small community located on the rugged and secluded northern California coastline. The locals love it for its quiet beauty and wilderness. Peace Totem at Timber Cove Inn. 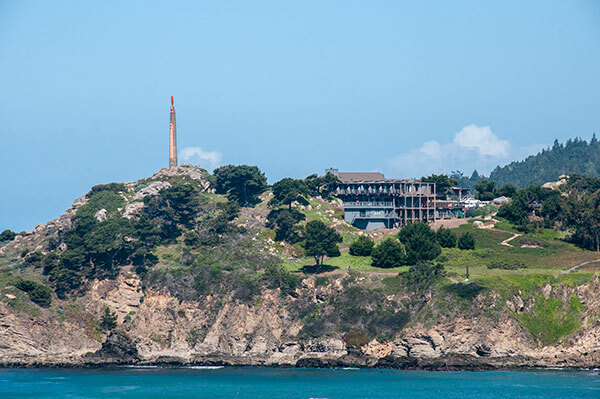 Timber Cove, a few miles north of Fort Ross on the Sonoma Coast, you will find Benny Bufano’s 93-foot piece of concrete, lead and mosaic Peace Totem on the grounds of Timber Cove Resort. 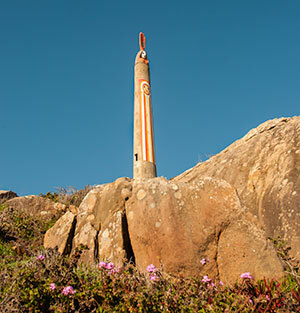 Beniamino “Bene” Bufano’s Peace obelisk, a towering, 93-foot homage to peace, the Sixties, and contemporary art. The 93-foot tall Beniamino Bufano Peace totem on the hiking grounds of Timber Cove Resort is one of his most well-known works. A truly thematic creation, the Sonoma art statue depicts the Madonna and child with up-stretched hands, and overlooks the wild Sonoma coast and the deep blue Pacific Ocean. Timber Cove Coastal Kitchen, Our coastal wine country concept offers organic, seasonal fare with clean, crisp presentations served amidst stunning ocean views. Local, farm-to-table plates feature organic fruits and vegetables, Sonoma cheeses, farm-raised chicken and lamb and sustainable and seasonal seafood. The wine list emphasizes acclaimed local wines, with additional pairings from throughout the region. In addition, Coast Kitchen also caters to private parties in Timber Cove's exclusive private dining room, Coast Commune, which houses intimate parties of up to 13 guests. Phone: 707-847-3221 - Reservations: 800-444-7275 Call 1-800-444-PARK (7275) for family sites and group campgrounds from March 15 to October 31. Rocky promontories, panoramic views, kelp-dotted coves, and the dramatic sounds of pounding surf; open grasslands, forested hills, pristine prairies, and pygmy forests- you can experience all of these coastal wonders within the Salt Point State Park. One of many ocean coves in the park. 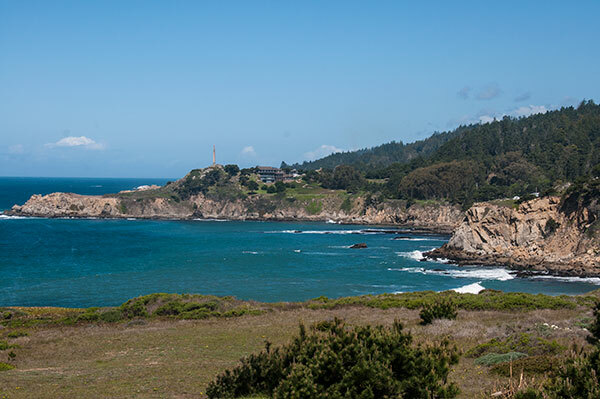 As the terrain rises northeast of Highway One, coastal brush and grasslands blend into lush growths of bishop pine, Douglas, fir, madrone, tan oak, groves of second growth redwood and quiet meadow areas. At the top of the coastal ridge, at about 1,000 feet elevation, there is a large open "prairie" where elk once grazed. At Salt point's highest elevation, you will find pygmy forests where stands of pygmy cypress, pine, and even the normally gigantic redwood grow only to stunted sizes. This is caused by the combination of a highly acidic soil that is lacking in nutrients and a hardpan layer just below the soil surface. 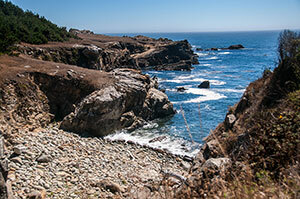 Similar stands of pygmy forest are found all along the Pacific Coast from Monterey County northward to Mendocino County. Abalone diving offers you a chance to get into the beautiful California waters and experience nature first-hand. Floating on the surface in green-blue waters among seals and sea birds, and diving down among kelp and schools of fish, you truly feel a closeness to nature that's hard to find elsewhere. Because free diving (snorkeling) is the only method allowed when hunting for Abalone, there is a high level of skill involved. 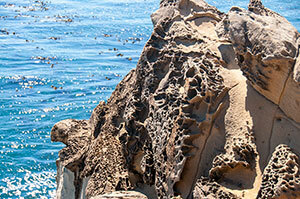 Gerstle Cove in Salt Point State Park is one of the top abalone diving sites on the Sonoma Coast. With 20 miles of hiking trails, over six miles of rugged coastline, and an underwater park, you can enjoy a variety of picnicking, hiking, horseback riding, fishing, skin and SCUBA diving, and camping. 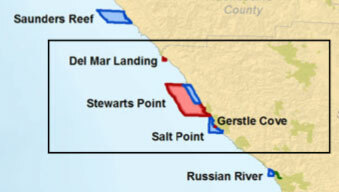 In the waters adjacent to Kruse Rhododendron State Natural Reserve there are four MPAs (Marine Protected Areas), Stewarts Point State Marine Reserve (SMR), Stewarts Point State Marine Conservation Area (SMCA), Salt Point State Marine Conservation Area (SMCA), and Gerstle Cove State Marine Reserve (SMR). Gerstle Cove was the site of considerable economic activity as a result of stone quarrying and lumbering. The area was first developed in 1853 by Joshua Hendy and Samuel Duncan who moved a steam powered saw mill into the area becoming the first such operation in the township. Mr. Hendy sold his shares of the operation to A. Duncan, Samuel Duncan’s brother, and the two operated the mill until 1860. From that time throughout 1870s, a series of owners that included Frederick Funcke, Lewis Gerstle, and W. R. Miller operated milling, cordwood, and tanbark operations. During the early years, stone and forest products were lowered down the cliffs on cables. Eventually, lumber chutes were built there, one by William R. Miller in 1872 and a second constructed by Frederick Funcke and Wasserman. Only one chute remained by 1889, and it was abandoned by 1917 due to economic decline, the movement of lumber via railways and trucks, and the changing use of the land to ranching. The 2016 Gerstle Cove survey investigated both land and underwater areas for archaeological remains to place the site in a larger maritime cultural landscape. Archaeologists recorded a large number of artifacts and features that illustrated quarry and lumber industry activities. Along the cove’s western bluff edge, an assortment of iron fittings (eye bolts and pins) dotted the cliff face. Rebates cut into the rocks on the foreshore revealed places where support legs held the lumber chutes projecting into deep water. Diving surveys at Gerstle Cove located a large iron folding stock anchor at precisely the location where the 1876 T-sheet depicted a mooring buoy. The anchor’s location at the cove’s mouth suggested that it was used to hold a waiting vessel rather than one actively loading. A similar- style anchor is located at the entrance to Gerstle Cove behind the entrance booth. Kruse Rhododendron State Natural Reserve is located approximately 20 miles north of Jenner on Highway One near milepost 43. 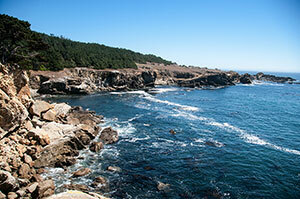 It is adjacent to Salt Point State Park. Leave enough travel time to get to the reserve due to the windy roads along the coast on Coast Hwy 1. 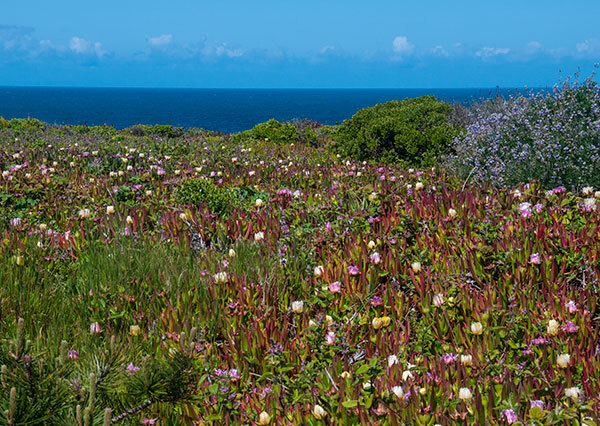 Kruse Rhododendron State Natural Reserve is located adjacent to Salt Point State Park. Edward P. Kruse donated the land to the people of California in 1933 as a living memorial to his father, a founder of San Francisco's German Bank. The land was part of a large ranch established in 1880, on which the Kruse family raised sheep and carried on logging and tanbark harvesting operations. Today, this pristine reserve contains second-growth redwood, Douglas fir, grand firs, tanoaks, and a plethora of rhododendrons. Each May these spectacular flowers burst into bloom and color the deep green of the forest with brilliant pink blossoms. There are five miles of hiking trails through the quiet forest with a short loop trail that leads through clusters of rhododendrons. Ferns carpet the canyons where seasonal streams abound. In addition to the rhododendrons, other understory plants include salals, pacific wax myrtle, and California Huckleberry. Please remain on the trails so that the young plants may flourish. No dogs or bikes are allowed on the trails.